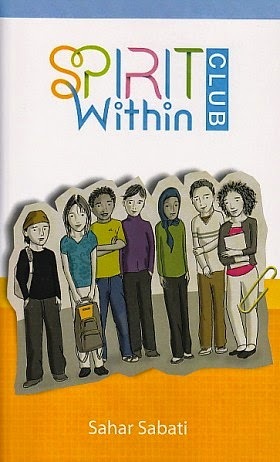 Today we are interviewing Sahar Sabati, author of the middle grade / young adult book Spirit Within Club. The second volume in the Spirit Within Club series continues where the first one left off; the characters are still trying to figure out how to make the world a better place. But they are a year older; emotions are becoming weightier, responsibilities are slowly increasing, and injustices strike closer to the heart. What made you decide to write a book about finding the “spirit within” when faced with obstacles? Drama seems to be the primary plot booster nowadays, be it in books, music, movies, or television shows. It gives the impression that the world is fuelled by drama when really, it isn’t. Similarly, a lot of attention is given to negative news; why is there so much about the bad choices that preteens and teenagers make and not more on the ones making the difficult, good choices? And, finally, there is a focus on the world being saved by a Messiah-like figure armed with superpowers—from Harry Potter to Superman. But the world is fuelled by the daily, often menial but still vital actions of the billions of regular people that live on this planet; if anyone is going to save us, it is those of us who tap into the spirit within. Anyone who looks at the state of the world and feels helpless, whatever their age may be, will end up cheering for the characters in this series as they struggle to learn how to make a positive mark. I also hope that it will inspire them to continue giving it their all. Two of the characters are loosely based on my sisters; they were by far the most fun to write! I do not have an overall favorite book; I have a favorite “book of the moment” which currently is Jennifer Niven’s "All the Bright Places." If you haven’t read it, you should. It’s beautiful, inspiring, and will raise your awareness about a very real challenge we are facing: depression and suicide. I tend to read a lot of non-fiction books based on whatever topic has piqued my curiosity. I also love Young Adult and Women’s Fiction, and also regularly pick up books from the Mystery, Literature, and Sci-Fi shelves of the library. I started writing when I was ten years-old; I had no idea what life was about and consequently, all my stories had massive plot holes in them! I would like to think I have become better at tightening those. Electronic books are wonderful! While paper books remain my preferred option, e-books make reading more accessible on so many levels. Anyone around the world with a smartphone can download an app and start reading, enlightening the thirsty minds of people around the world who would otherwise have no access to books. It is also a lot easier to carry around a couple of books at the same time without hurting one’s shoulder! I would like to finish the seven volumes of the Spirit Within Club series; I would like to see it continue being used in Brazil as part of an empowerment programme, as well as spread to other countries in the world. I also am going to write a couple of young adult books (one is already in the works!) as well as some women’s fiction books (again, one is already in the works!) I hope that with every new book that I complete, my writing will have become significantly better and an increasing number of readers will be inspired. The first volume in the Spirit Within Club series is currently being used by a non-governmental organization in its empowerment programme for preteens between the ages of 12 and 15. It is a dream come true: to be able to contribute to the betterment of society through writing so directly! Thank you for the opportunity to be interviewed for Writers' Interviews; I love hearing from readers, so if you pick up Spirit Within Club, please drop me a line on my Facebook page! `I’m very dizzy,’ she whispered. Silence fell until the teacher had disappeared into the school. I don’t like Laura. She isn’t the nicest person around. She and her group are some of the people who tease Zafirah constantly. `Stop it,’ I snapped at her. `And why would I?’ Laura said. `What name?’ I repeated. I really didn’t know what he was talking about.